A 5mm Cushion Court Diamond set Argentium Silver Wedding Band. Personalised with 2 Names up to 12 characters each. Sterling silver is graded at 925 parts per 1000. Britannia is 958.4, but Argentium has the highest pure silver content at 960. 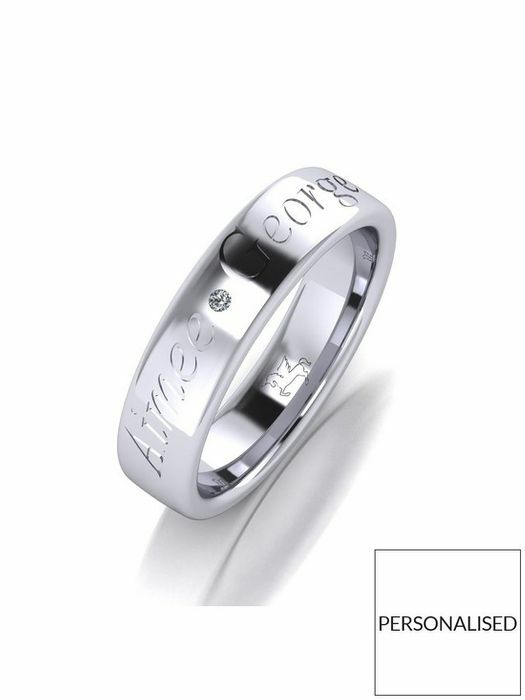 Our Argentium 960 Silver wedding rings carry the Britannia Hallmark. Argentium 960 is the lowest maintenance silver available and therefore requires cleaning much less often than other silvers. Argentium is the best in class for tarnish resistance whiter and brighter than sterling silver and Platinum. This ring has been made in Birmingham's Historic Jewellery Quarter. Cushion Court wedding rings are slightly rounded on the outside and inside for a comfort fit. Supplied in a double deluxe ring box.